Big changes are coming to the Starbucks Rewards program and they've got some of the chain’s loyal coffee swillers up in arms. On Tuesday, the coffee purveyor rolled out a new way for people to earn free food, drinks, upgrades, and more. Members can now earn rewards faster, but not everyone’s pleased. 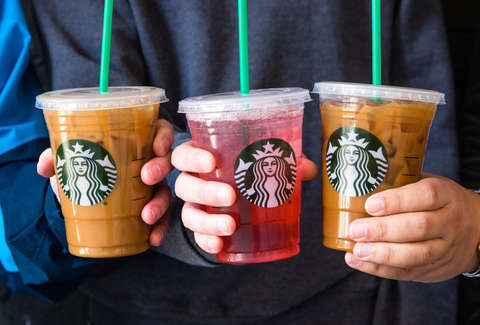 Starbucks announced the changes in March, revealing how it would affect the more than 16.3 million people who use the loyalty program to score freebies. Despite the warning, customers are worried they won’t get their money’s worth with the new changes. The stress began when some people’s stars, which Starbucks customers earn for each dollar they spend, disappeared when the changes were implemented. In the past, Starbucks Rewards members got green status upon signing up for the program and started working toward gold status with each star earned. The coffee giant has assured customers it’s all going to be OK. Members who achieved gold status (earning 300 stars or more) will get to keep the stars they earned. Others, however, will have to start fresh, though everyone will be on a single level of rewards. According to a release from the company, you’ll be able to start earning stars toward free stuff at Starbucks the moment you join and you can redeem them sooner. A New Tiered Structure: The Starbucks Rewards program now features tiers, instead of a single option which means more ways for users to put their stars toward free stuff. With 25 stars you can customize a drink with an espresso shot, milk choice, syrup, and more. Fifty stars can be used toward a brewed hot coffee, hot tea, or bakery item. You can apply 150 stars toward a free handcrafted drink, hot breakfast, or parfait while 250 stars will get you a lunch sandwich, protein box, or salad, and 400 will get you select Starbucks swag and coffee products. Non-Dairy Options: Rewards members can now use stars to substitute alternative milk choices in their favorite drinks at no additional cost to them. Free Refills: Rewards members get free in-store refills on brewed coffee or tea, hot or iced. Even if you ordered something fancy for your first drink, you can refill your cup with something simple for no cost. Who would pass that up? Birthday Gifts: Rewards members will get a Birthday Reward to redeem for food or a drink on their special day. Score Stars at the Grocery Store: Members can now earn stars by purchasing certain marked Starbucks items at the grocery store. Credit Cardholders’ Stars Never Expire: Starbucks Rewards Visa Credit or Prepaid Card users’ stars don’t expire. Other users, however, will lose unused stars after six months. More Stars for Everyone: Starbucks Rewards members will have even more opportunities to earn stars, including double-star days, offers tailored specifically to them, games, and more, which kind of makes up for Starbucks wiping your account clean. The new program isn’t just sending Rewards members into a frenzy. The transition is creating a few hiccups in stores. Starbucks is trying to curb the madness, but the coffee purveyor is asking that customers bear with them while they make the transition. Change is never easy, especially when that change impacts your ability to score free stuff. It’s typically worth it in the long run, and once you start racking up stars you’ll probably forget any of this ever happened. Earn on, coffee fiends.